I made some cropmarks that worked well from me so I though I would share them. I made them as simple as possible and if potential clients see them they would not be distracted by them. 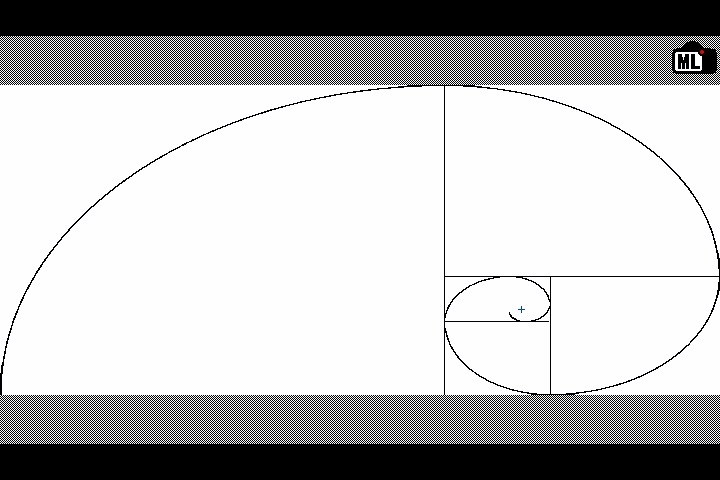 The pack includes 1.77:1, 2.35:1 and 3:2 ratios of the Rule of Thirds, Golden Triangle, Golden Spiral compositions. It also includes the "Fincher Fifths" and 5x zoom preview. As well as a EF-S cropmark if you are using an EF-S lens on an full frame camera. The actual viewable image of an EF-S lens on a full frame sensor changes from lens to lens so I based it solely off of the image sizes. It also includes crop marks with and without the ML Logo. The cropmarks will work on all ML supported cameras. They are always scaled to fit the 3:2 LiveView image. If there are any issues, please post here with the details and I will attempt to fix them.The community has my permission to do as they like with these images and could even include them in the nightlies or final product if they wanted. Keep in mind you can only have 9 cropmarks activatable at this time in ML. You will want to pick the ones that fit you best. "ML Essentials," a folder has the most often used in one location for easy picking. Instructions / Information included in the download. Has anyone tried these? Did they work on other cameras other than 5D3? I would like to see a custom crop mark that has 16x9 or even better 2.35:1 aspect with thin red x5 crop box highlighting the actual area that appears in recording - so at a quick glance in 'normal' mode, you can see what the x5 crop record would be framing (before committing to selecting crop mode). This would be very useful to quickly judge what framing would be on various lenses...without having to punch in and try and judge from ML greyscale low resolution image (but has accurate framing). I could try them out for you but I'm on 1.2.3 -- do I have to downgrade first before I do this? From my readings in this forum, the picture format should work with any ML Camera. I have since upgraded to 5D3 1.2.3 from this first post and have not had any issues with them. I'll update the first post to include this. This is a interesting idea. I will have do a little homework to get the crops right. I'll check it out and post what I have found in the coming days. Cropmarks work on all cameras (even on the old 5D classic, with lower screen resolution). They are always scaled to fit the 3:2 LiveView image. The only compatibility problem that may appear is with some transparent colors (they may appear pink on 5D2, for example). please put this one into the downloadable set. I'll put that in the first post. I sure will update it to include it. I have been doing a little more research and currently redoing some of the ones I have provided. The math is just slightly off on some of the ratios so I am mathematically making sure all of the ratios are just right. It takes some time trying to make them look good because you can only have black or white for the guidelines, no greys in between and I want the curves to look as smooth as possible even with this limitation. I also want them to look as simple as possible, not to distract you from the image you are working with. Especially if a client is looking at the screen. Instead of having multiple different copies of similar products, I am just going to re-release when I am happy with them in one big pack. I will also be including some of the "Fincher" crops and the zoom crops as requested as well as photography variations. Keep in mind I am doing this in my spare time. I am sure not a lot of people are anxiously waiting on this product so it is not my highest priority. I have updated the Cropmark Pack to v1.1. All of the cropmarks are now mathematically exact to the ratio. A sleek, simple design has been applied to all of them. 5x Zoom preview to help see where your zoom will be by default in Canon Preview mode compared to the pixelated MLGrayscale. All organized and renamed to be viewed inside ML on camera. Added some more photography variations. Questions, comments, requests, issues? Post them here. Thank you for working out the crop highlight box - it is very useful to me for quickly getting perspective on how much of a crop is being made - before entering that mode. Very useful to see, especially when swapping out lenses and planning the coverage when crop mode is enabled. Only thing I noticed was I had to align the white Canon focus box to get crop highlight area to line up correctly - but that was pretty easy to work out. I did a couple tests on my 5D3 1.2.3 when it comes to the zoom crop mark. I placed it on a sturdy tripod at its normal zoom, or no at all, and recorded a second or so. Then, I zoomed in and recorded another second. Then, I zoomed back out and the zoomed in, moved it the recording selection and then pressed the "directional stick" all the way in to reset the selection and recorded another second. I then pull them in Photoshop and aligned both perfectly on the zoomed out image and say there were both in the exact same spot so I made the cropmark there. There may be different variations camera to camera. Which camera are you using? That was the exact technique that I was thinking would work (Photoshop alignment). I'm slightly embarrassed that I did not already know the directional stick reset press to properly align the canon focus box area. Now I've done that - all lines up perfectly every time. I'm on 5d3 1.1.3 build. Thank you again for implementing this, it works great. 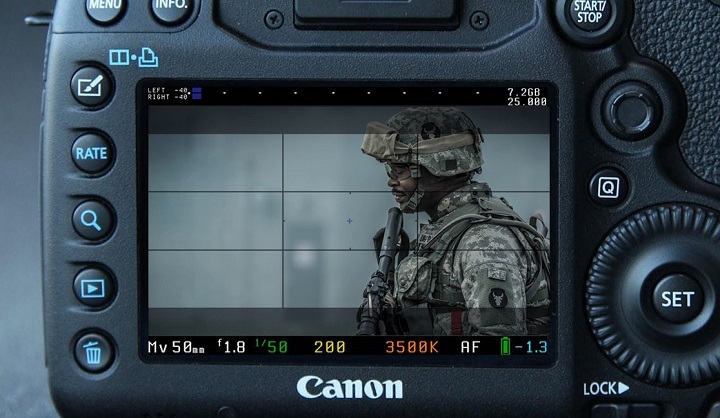 As for other crop mark ideas, I could see that some cinematographers may find it extremely useful to see a frame line denoting APSC and APS-H sub line markings (for full frame canons to display S35 sized sensor areas). This would make a very handy viewfinder for planing camera placement/ location scouting when using full frame cameras but the when shooting main unit camera on Arri Alexa or Red cinema cameras - which both have APS-H sized sensors (very close in size to APSC). Again - this is would be a great tool to check lens FOV coverage/ crop factor of smaller sensor sizes, when viewed on a full frame canon camera. That would be a good idea to also include. I'll have to revisit this in some time due to other projects coming up. I'll include this in the next batch. Actually making these is the easy part, doing the math is the time consuming part. The EF-S image sensor is just a bit smaller than a Super 35 mm size. With the thought that it would just be used as a guide and no actual production, I felt I would not make individualized cropmarks for each sensor size. It would take me quite a while to do the math to ensure it is centered properly. EF-S is more practical so I will stay with that. I have updated it to include an EF-S cropmark from a full frame camera. I do not have any EF-S lenses so I was not able to properly test this. I based my tests off of what I could find online of EF-S lenses on the EF mount. It seems that the EF-S lenses can illuminate more than just the APS-C sensor size depending on the lens and the focal range. Due to this, there does not seem to be a perfect cropmark. So, I based the size difference of full frame and APS-C which is approx 66.6%. 720p is 66.6% of 1080p. This is essentially a 720p cropmark, which is easily adjustable in ML and is a great safe zone for EF-S on EF. Cool. I am interested. Be careful using EF-S on EF. I have read some EF-S lenses rear element goes into the body some and could hit your mirror when taking photos. They are cinemascope without any distractions, The way the transparency is made, works well in combination with "Digic peaking slightly sharper" turned on. I do like the way you have the cropmarks with having horizontal lines. Both of those work great! Thanks for these crop marks @ChadMuffin! They're awesome and superclean. I've been trying to get the 5x zoom crop marks to line up with my actual mlv recording but i can't get it right. I'm using a mk3 on a tripod and recording normal mlv. I took a screen shot of the lcd with the 5x zoom crop marks. Then I record crop mode. I took another screen shot of the ML grayscale preview on the lcd. I compared the 5x zoom crop marks and the actual crop mode mlv recording. It doesn't line up. Seems like the recording is much more cropped in than then the 5x crop marks. Am I doing something wrong? Or are these marks not meant to show you what you are actually recording? Thank you for the kind words. I may be misunderstanding your questions. The cropmark for the 5x was intended to be used as a preview only to the 5x crop in its default location while at 1x crop (or no crop at all). This is becuase the 5x crop greyscale preview is slower, lower resolution and not the best. I did not base the cropmarks for the 5x zoom off of the grey scale preview. I based them off of the actual DNGs coming out of the camera due to those being the "real" crop comepared to the greyscale preview. If you use the cropmark while at 5x zoom, you will still have the cropmark over your already 5x cropped greyscale image. There are no options to change this option in ML at this time and that was not the intention. The intention was to use it as a guide, only. No worries I figured it out. I compared them to the DNGs and it matches up perfectly! I ended up making a preset on my smallhd dp4 so I can do a 1:1 pixel zoom and your crop marks almost fill the screen. Really awesome preview...thanks again for these! Glad to help! Even if I am not a programmer.